Milton Roy Lovett, 55, was arrested Sunday night on charges including DUI, DUI with property damage, careless driving and resisting an officer with violence, according to an arrest report. A Miami Police reserve officer was arrested on DUI charges after authorities say he struck another car and garbage cans while driving in Miramar. The report said Lovett was arrested after another driver called police to report that his car had been struck by another car near Miramar Parkway and Southwest 67th Way and the driver didn't stop. Just before that, there had been another call of a car hitting a garbage can at the same intersection, the report said. As officers responded to scene, Lovett approached and said "I hit this car and my car is around the corner," the report said. The officers noticed Lovett had an odor of alcohol emanating from his person, and asked if he had been drinking and he told them he had, the report said. 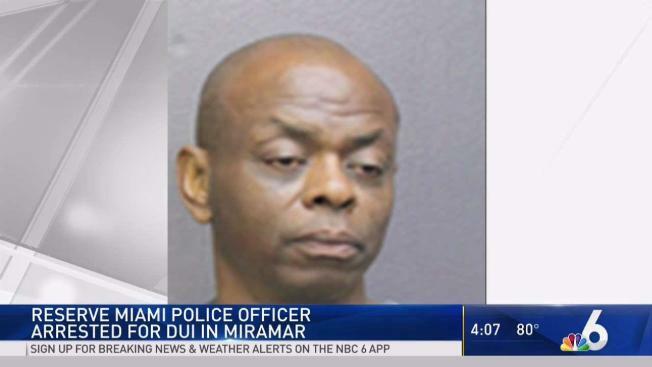 A Miami Police reserve officer was arrested on DUI charges after authorities say he struck another car and garbage cans while driving in Miramar. Milton Roy Lovett, 55, was arrested Sunday night on charges including DUI, DUI with property damage, careless driving and resisting an officer with violence, according to an arrest report. When they asked where he was going, Lovett responded "I don't have to tell you anything," the report said. During the conversation, the officers noticed that Lovett's speech was slurred and he had alcohol on his breath, the report said. Officers found Lovett's car, which had heavy damage to the right front bumper and had a damaged trash bin at the front. Another damaged trash bin was found on Miramar Parkway. Lovett refused to perform field sobriety tests and when he was told he was being arrested, he resisted and it took two officers to place him into custody, the report said. Lovett told an officer he hit the other car because he had been driving too fast, but told the officer he had drank four beers over five hours at a bar in Hollywood, the report said. He also refused to do a breath test, the report said. Miami Police officials confirmed Lovett spent 14 years as an officer in their department but retired in July 2013 and is currently a reserve officer. Lovett was booked into jail where he was being held on $3,500 bond Monday, jail records showed. Attorney information wasn't available.